Various academics addressed the meeting, which was filmed and posted to social media. It appears to have since been deleted from Twitter. The university’s Director of the Southgate Institute of Health, Society and Equity, Fran Baum – a Matthew Flinders Distinguished Professor of Public Health and an Order of Australia recipient – told the meeting “the rich forest that was the Flinders academic community has really been clear-felled” by the proposed changes, which have left staff morale at rock-bottom. “There’s a really low level of staff morale at Flinders,” Baum said. She said there was a “real risk” that plummeting morale would affect staff performance. Academics, she said, had been “treated in an unfair way” in the restructure process, which she described as “heartless, cruel, disrespectful and unnecessary”. In a scathing missive released last week, the National Tertiary Education Union said Flinders management was undertaking a “destructive University-wide academic restructure that threatens to jeopardise its proud reputation in teaching and research”, with “over 200 jobs affected”. “Accreditation of numerous prestigious courses including Medicine and Education are at risk, and Flinders stands to lose valuable research programmes and researchers because of the restructure’s flawed basis,” the union said. NTEU Flinders Branch President Dr Andrew Miller decried the “hyper-accelerated timeline” as “grossly inadequate for staff to make informed decisions or provide due diligence on the proposals”. Several individual staff positions were listed as “affected” by the plan in a document published on the university’s website earlier this year, which would see staff having to reapply for their jobs in a “merit-based selection process”, according to the union. The move will separate researching roles from some teaching staff, following a move last year to consolidated faculties – which made a further 200 staff redundant. The union’s statement said Flinders was “careening towards massive reputational damage as it rushes through a process that should otherwise be thorough and evidence-based”, and said staff and students “are expressing little confidence in Vice-Chancellor Colin Stirling and University Council senior executive to deliver ethical governance or empowering leadership”. The restructure was given the green light to proceed at a Fair Work Commission hearing yesterday, with Commissioner Christopher Platt recommending “the organisational change process should continue with some urgency, with the aim of all employees being advised as soon as possible of the proposed effect on their position, the conduct of a genuine consultation process, selection processes (where applicable) and the communication of final outcomes to effected employees”. Vice-Chancellor Professor Stirling said the university was “pleased to accept the recommendations from the Commissioner and, accordingly, will now act swiftly to transform its staffing structure”. “We have a vision to equip Flinders with the specialist academic positions that it needs to ensure its future success,” he said in a statement. The Commissioner recommended that the University publish final proposed structures for each College by December 12, and consult with affected staff between December 14 and 20. Flinders said in a statement that it could “as a result… proceed with appointments to uncontested positions and with processing Voluntary Redundancy applications before the end of the year”. However, it emphasised, “the proposed Academic Restructure will increase the number of continuing academic positions at Flinders, and position the university to invest in education programs and substantially boost research”, with “the large majority of academic positions… unaffected by the change”. Nonetheless, Baum told the council meeting that “all staff have been affected, whether they’ve been designated or not”. Law professor Margaret Davies told the meeting that as a “consequence of the lack of information and transparent communication… there’s a strong risk that decisions will be made about staff that do not meet the requirements of procedural fairness – and are therefore unlawful”. Staff have accused the university of trying to “game the system” by seeking to increase its international ranking through a hasty restructure – a point raised in this week’s meeting by emeritus professor Leon Lack from the college of Education, Psychology and Social Work. He warned the methods of calculation for international rankings could change, “and then the desired boost would be shortlived – and Flinders would experience a significant drop of ranking”. “The present strategy seems to be opting for a short-term boost to international rankings but exposes [Flinders] to significant long-term risk,” he said. 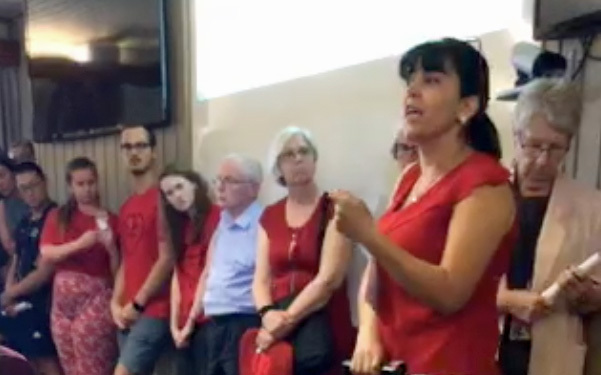 Flinders chancellor and council chair Stephen Gerlach responded, telling the gathered objectors – who appear to be comprised of staff and students – “we’ve heard one half of the story today”. “The other half of the story is that for a variety of reasons this council has a responsibility… and that’s to make sure this university succeeds,” he said. He said these included looming government policy changes as well as “changes affecting all people in this country and globally”. To audible heckles, he said the aim was to ensure in five to 10 years’ time “this university is a university that delivers on what its ambitions are, [meets] the career aspirations of all its staff, and maximises student experience”. “There are decision that need to be made – and the people responsible for making these decisions believe that’s the way we achieve our objectives,” he said, sparking calls of “Shame”. Opponents of the restructure make their voice heard in the deleted video. He prompted further outcry by “badly quoting the saying of our first vice-chancellor [that] ‘sometimes we have to be brave to make sure we get where we want to be’”. He urged opponents of the restructure to “see it in the broader picture”. “I accept we have to, in the long-term, improve our rankings -because our future depends on it… but I don’t accept for a minute the insinuation we’re doing it for short-term gain,” he said. He defended Vice-Chancellor Stirling against what he described as unfair attacks, saying he was “committed to the university for at least the next six years” and was dedicated to serving its “long-term aspirations”.